Stop School Cuts in Surrey! The Government is putting the performance of Surrey schools at risk with massive cuts to school funding. 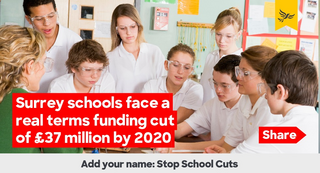 Across the country, 98% of schools face a real terms cut in funding with £3 billion cut by 2020. Here in Surrey, that means a funding gap of £37 million by 2020 - which is a cut of £274 per pupil and the equivalent of losing 995 teachers. "WE THE UNDERSIGNED CALL UPON THE GOVERNMENT TO LISTEN TO PARENTS AND TEACHERS IN SURREY, AND PROVIDE A FAIRER FUNDING DEAL FOR SURREY SCHOOLS"